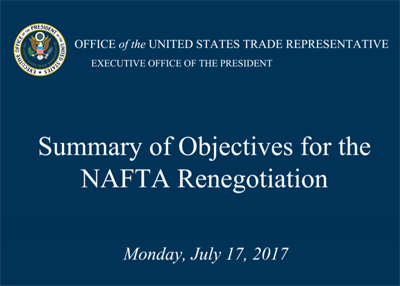 On Monday the U.S. Trade Representative’s office released initial trade objectives for the Trump Administration’s NAFTA renegotiation. Rather than accounting for the calls from public health, labor, and sustainable agriculture groups to make NAFTA a truly fair agreement, the goals reflect elements of recent poorly crafted trade agreements like the Trans-Pacific Partnership. Specifically, they lack objectives to conduct negotiations through an inclusive and transparent process, which is the only way to ensure farmers, working families, environment, and public health benefit from the trade agreement, rather than large corporations out to protect the bottom line. The objectives also indicate that Investor State Dispute Settlement (ISDS) will be expanded, rather than ended. This is the mechanism that allows corporations to sue governments if regulations interfere with profits, undermining environmental, health, and labor regulations local or national governments attempt to set and enforce. Renegotiating NAFTA can be an opportunity to mitigate and reverse the damage done to millions of farmers and working families in all three countries over the last two decades. Unfortunately, the recently-released objectives indicate the Trump Administration instead intends to double down on provisions that keep working families and small-scale farmers marginalized and instead use NAFTA to boost the profits of the wealthiest individuals and corporations. Top objectives for any new or revised trade policies should be inclusion of all stakeholders, transparency of negotiations, building sustainable agriculture systems, ensuring dignified livelihoods for all, and meaningfully addressing the climate crisis. Unfortunately the new trade objectives include none of these priorities. It is urgent and essential that Congress and the President hear from all of us demanding truly fair trade through the NAFTA negotiation! Newsletter 178: What Happened to Trump’s Campaign Promise for Better Trade Rules? New NAFTA must not be old TPP race to the bottom on Environment, workers rights, sustainability, and undermining of National Sovereignty. Say No to NAFTA that puts corporate rights before democracy, environment and transparency to the people. Your gutting NAFTA and rather than accounting for the calls from public health, labor, and sustainable agriculture groups to make NAFTA a truly fair agreement, the goals reflect elements of recent poorly crafted trade agreements like the Trans-Pacific Partnership. I agree that mitigation and reversal of damage done to millions of farmers and working families in all three nations over the last two decades need URGENTLTY addressed. Why are working families and small-scale farmers being marginalized? This just isn’t fair. FAIR TRADE is what’s fair. Please address and make the changes to/for this group of people that is sorely needed. Compassion in business seems to be missing. I agree that the top objectives for any new or revised trade policies should be inclusion of all stakeholders, transparency of negotiations, building sustainable agriculture systems, and insuring dignified livelihoods for all. The new trade objectives include none of these priorities. WHY? WHY? WHY isn’t the government protecting these people? Where’s the LOVE? LOVE DOES belong in business! Put it back and see everyone succeed. The ISDS will KILL our planet as it chokes and starves us further. Abolish it now.